allowing you more time with your dogs! If using Pop Money, make Payment to the Email Address for that specific trial event. As Guest, you may use this live site to see how it works without entering a real trial. Entery any trial that is available (it will be fake) but you will receive an email confirmation your fictitious entry and see how easy it really is!. If you have any trouble, click HOME in the blue navigation bar above to get back to here. 3) Auto-Fill USBCHA forms and reports. 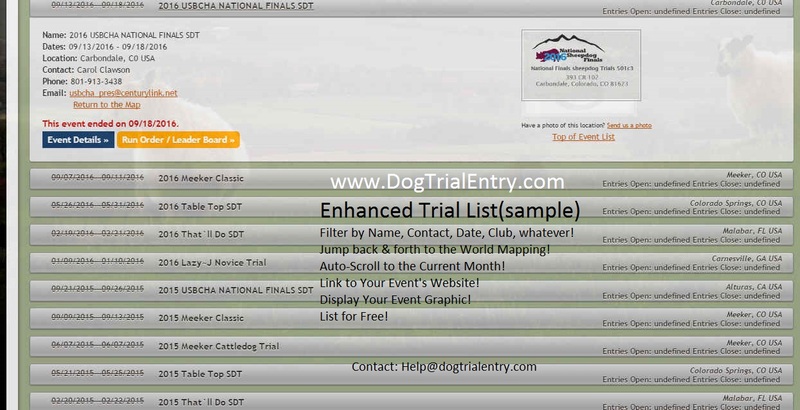 DogTrialEntry.com is the preferred method of entering a dog trial in North America. Our mission is to be the most reliable, most convenient, and easiest to use, way for trial participants and trial hosts to deal with the paperwork issues of attending and presenting a dog related event. People can now enter events online, any where in the world with an internet connection. Trial hosts will be able to minimize the typical hassles of generating running orders, filling out score sheets, and even calculating USBCHA payment forms that are needed to process an event.. Our services are deployed and monitored utilizing the World Wide Web by experienced, qualified, subject matter experts. Our subject matter experts are available to ensure the effectiveness and quality of our deliverables. We are committed to maintaining the highest standard of excellence across our full line of deliverables by interacting with, and listening to our customers and potential customers, and also through Participant Events, Inc. employee education. Over 1000+ Handlers, Trial Accounting, auto-emails, sortable scores, and more. Wanna work at a nice farm?